100px Lightning Aura: Deals Magical Storm Damage to all enemies within its radius. 100px Boost Aura: Boosts damage dealt and reduces damage taken for all Defenses within its radius. 100px Serenity Aura: Heals each second and reduces damage taken for all heroes within its radius. 100px Sky Guard Tower: Fires a projectile at a flying enemy that deals Magical Damage. Fires an extra projectile for each nearby flying enemy. 100px Pole Smash: The Monk slams his weapon into the ground, dealing Crushing Physical Damage to nearby enemies and knocking them into the air. 100px Chi Blast: The Monk sends forth a gust of Chi energy in a piercing line, dealing Magical Damage and knocking enemies backwards. 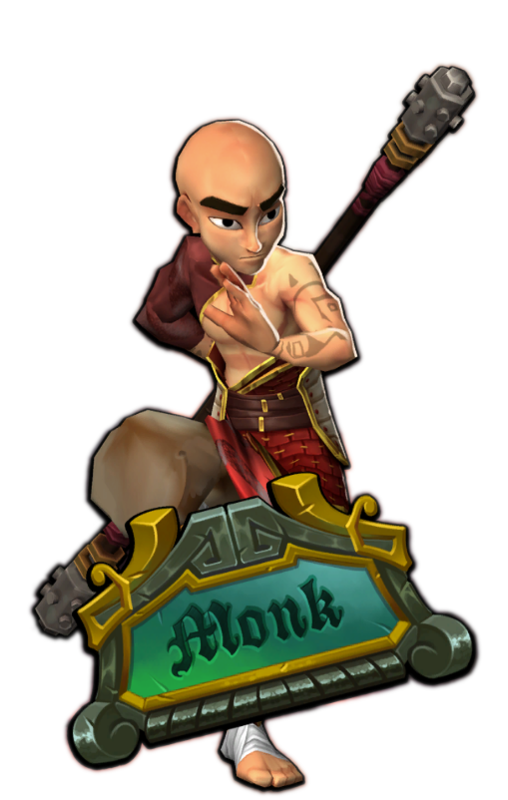 100px Heroic Wave: The Monk emits a wave of stabilizing energy that Heals all nearby Heroes and increases their Hero Power for a time.